RYA Sailing Course Gift Vouchers in the Mediterranean. A Jolly Parrot gift voucher is the ideal present, for a birthday, Christmas or any other special occasion. Each voucher is redeemable in full or part against our RYA sailing courses, Combined courses or mile building adventures. So maybe you have a loved one who has always wanted to learn to sail or maybe experience the thrill of sailing in a race, this could be just what they need! 1) Select from the drop down menu below, the course or adventure that you wish to gift. If unsure you can just choose a 'Money Off' voucher! 2) Enter the name of the recipient. 4) Make payment through our secure payment portal. 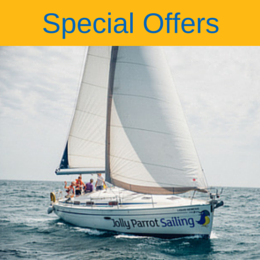 Once payment is received, within 24 hours, Jolly parrot Sailing will email a personalised, printable PDF gift voucher to the address supplied. This will contain a unique discount code that the lucky owner can use on our website to book the course or event on the dates that suit them. How easy is that?